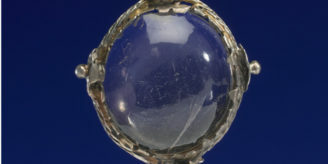 An exhibition at the Ashmolean Museum, ‘Power and Protection‘ is “the first major exhibition to explore the supernatural in the art of the Islamic world”. The exhibition also offers a rare chance to see one of the highlights of the Wellcome Library collections: the ‘Book of the Birth of Iskandar‘ or ‘Iskandar Horoscope‘, a 15th century manuscript with the horosocope of a Timurid prince, Iskandar Sultan. 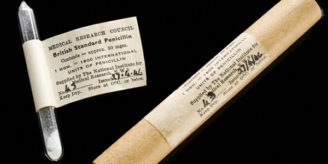 Nowadays supernatural implies something beyond scientific understanding, but this was not so for a contemporary Islamic user of artifacts or books on magic in the past. The ‘profession’ of a magician among pre-Islamic population of Middle East did not cease to exist with the advent of Islam. Magic and especially talismans, horoscopes and other protection items were considered to be as powerful as prayers. By Islamic law they were allowed to be used provided they did not contradict the teaching of Islam. Moreover God’s Word as reflected in the Islamic (and even Christian or Jewish) scriptures was believed to possess a supernatural power and was widely used in talismans. 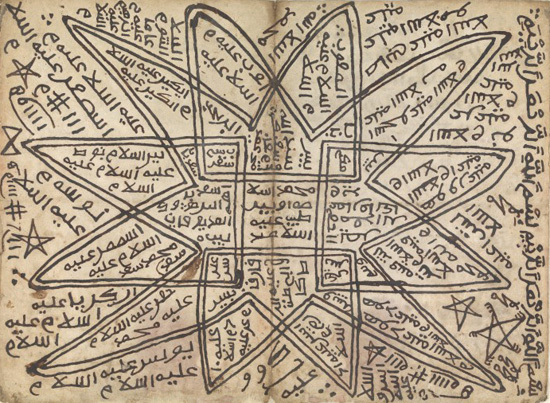 This 19th century Sudanese drawing of an amulet includes spells against the ‘evil eye’. Wellcome Library reference: MS Arabic 21. The Wellcome Library is an important repository for Islamic talismans, which come from all over the Islamic world, especially from Sudan. Amongst these talismans the ‘star item’ is the horoscope of Iskandar Sultan who ruled much of modern southern Iran in the 15th century. Jalāl al-Dīn Iskandar Sultan ibn ‘Umar Shaykh was a favourite grandson of Tīmūr alias Tamerlane (d. 1405) who conquered much of Persia and Central Asia. 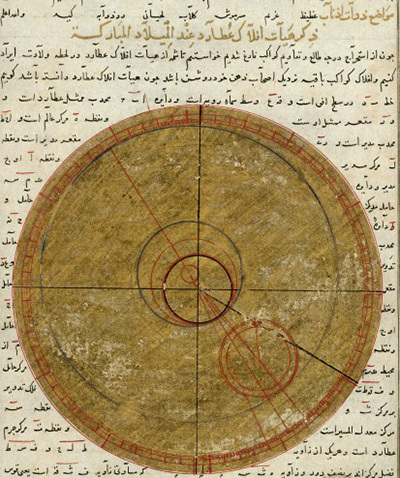 A fold out page from the ‘Iskandar Horoscope’ showing the position of the planets at the moment of Iskandar’s birth on 25th April 1384 in the form of a planisphere. Wellcome Library reference: MS Persian 474. Iskander Sultan was an ardent bibliophile and a patron of the arts. His enthusiasm is witnessed by a number of exquisite manuscripts produced for him and now preserved in libraries around the world. 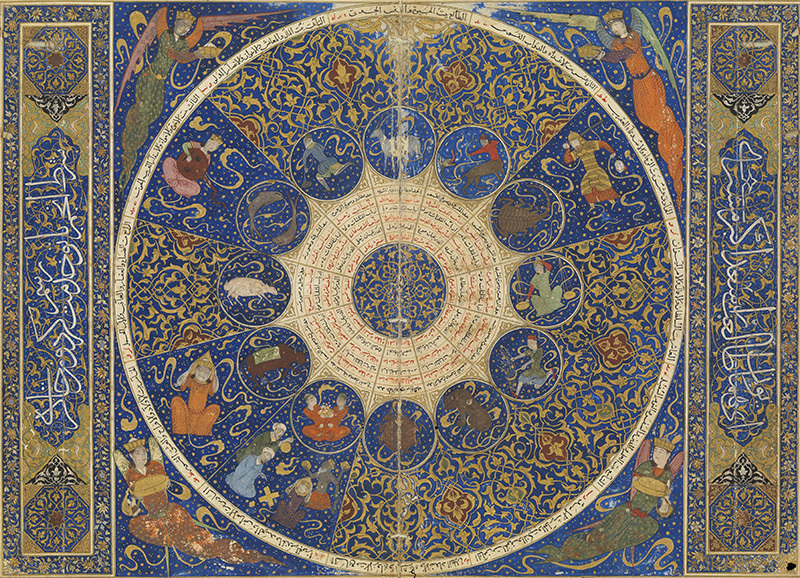 The horoscope held by the Wellcome Library was cast on the 22nd of Dhu-l-Hijja 813 AH (18 April 1411 CE) by the court astrologer Mahmud Ibn Yahya ibn al-Hasan al-Kashi, in the second year of Iskandar Sultan’s reign, when he was 27 years of age. 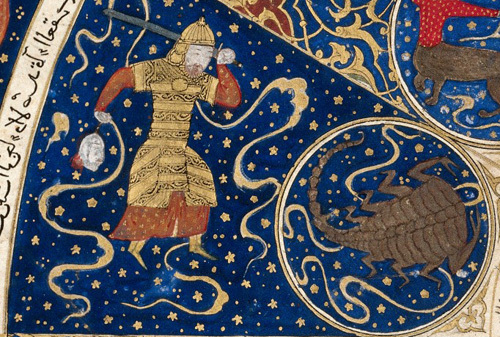 Detail of a page from the ‘Iskandar Horoscope’ showing an astrolabe with Mars Wellcome Library Reference: MS Persian 474. The manuscript is an exquisite work of art and an exemplary production of his royal kitabkhana (publishing house). The manuscript is also a magnificent example of collective work. The text was transcribed by several hands, although it looks like it was transcribed by just one individual. It is lavishly illustrated and reflects the efforts of a whole range of specialists: astronomers, illuminators, gilders, calligraphers and specialists in paper-making. Detail showing house of Pisces, with the planet Venus personified as a woman playing a lute. From the Iskandar Horoscope’. Wellcome Library reference: MS Persian 474. The miniatures reveal many interesting astronomical views and features, among them the planispheric view of the heavens. Vibrant colours, mathematical calculations, ingenious lay out of text and tables – everything makes this item a masterpiece of Central Asian art and mathematics. 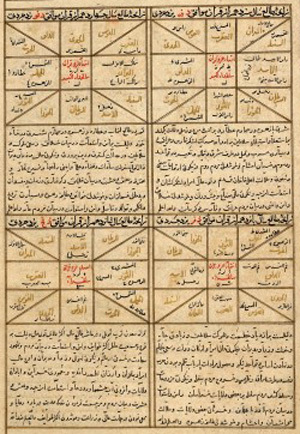 Page containing tables from the ‘Iskandar Horoscope’. Wellcome Library reference MS Persian 474. Understandably the horoscope indicates that the person for whom it was cast was born with good fortune. The stars predicted him a long and prosperous life and Mars symbolized his future victories. The reality was quite the opposite. Iskandar Sultan ruled for just five years (1409-1414) before he died after rebelling against Shāh Rukh, his overlord. Detail showing the planet Mars in the house of Scorpio. Mars is depicted as a warrior with sword in one hand and decapitated head in the other. From the ‘Iskandar Horoscope’, Wellcome Library reference: MS Persian 474. Dr Nikolai Serikoff, Dip.Lib. is Asian Collections Librarian at the Wellcome Library. He specialises in Oriental librarianship, manuscript cataloguing and Greek and Arabic lexicography. He designed the Wellcome Arab Manuscripts Online catalogue of digitised manuscripts.